An 8.8 magnitude earthquake struck Chile about 115km (70 miles) north-east of the city of Concepcion and 325km south-west of the capital, Santiago. Paniko has put together this Google My Map, called Mapa Comercio Activo, to show the locations of supermarkets that are still operating in Chile after the earthquake. The map is set as open collaboration, so anyone can add open stores to the map. 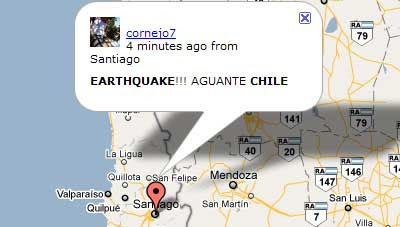 Ushahidi has produced this Google Maps mashup to track the latest news and incidents related to the Chile earthquake. The map reports incidents such as collapsed roads and buildings to try and provide as much up-to-date news for Haitian citizens as possible. It is possible to submit information to the map by completing a short form. Ushahidi have also integrated Google's Person Finder gadget and a live Twitter stream of news from Chile. The Google Maps for Flash API mashup uses data from the USGS to show the latest earthquakes around the world. 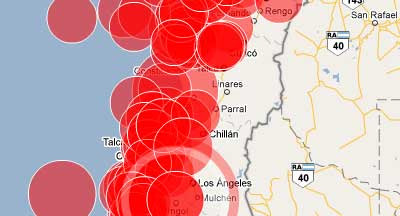 The site uses different sized red circles on the map to show the scale of earthquake activity at different locations. If you roll over the red circles details about the magnitude of earthquake and the time of measurement is given. 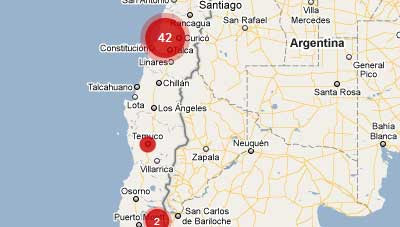 Mibazaar has put together this real-time Twitter map showing the latest messages about the Chile earthquake. Currently the map is displaying Tweets from around the Santiago area, with an option to view messages from Hawaii, which is currently under a Tsunami warning. This map shows recent earthquakes around the world. It also includes the latest earthquake news. The map uses different coloured map markers to show the strength of different earthquakes. This map uses the Google Earth browser plug-in with the USGS's KML of the past 7 days' earthquakes. This Google Earth browser plug-in tool also works with other KML's. Just replace the KML address in your browser address bar to view other KML's in the plug-in. Danish newspaper Ekstra Bladet is using a Google Map to show where immigrants to the country are settling. The map shows that there are higher concentrations of immigration to certain communities in the country, such as Copenhagen, High-Taastrup, Ishøj and Albertslund, and the newspaper points to concerns about the possible ghettoization of immigrant communities. Coloured map markers show the percentage of immigrant communities in each of Denmark's municipalities. You can click on each of the markers to get further information about the selected area. You can also open a municipality map marker by selecting the region from the drop-down menu below the map. The U.S. Census Bureau has created a Google Map to show how well different areas responded to the 2000 Census. The map displays the percent of census forms mailed back by households that received them. 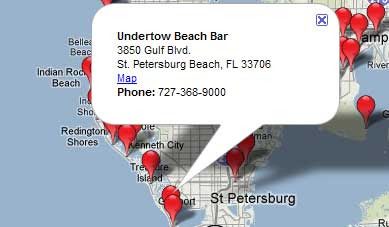 To use the map, enter your zip code, or your city and state and click the 'find' button. Your location will then appear on the map. you can then explore the participation rate for your area by choosing 'county', 'place', or 'local' views. When the 2010 Census begins in March 2010 the map will also track mail back 2010 participation rates, enabling you to see how well your community is participating in real time and to compare your community with others. Google have added a new navigation tool to the user photographs that can be viewed when in Street View. When viewing user photos you will now find 'orbs', small silver circles, on and around the photo. These new orbs allow the user to click-and-drag to move to a new nearby photo. You can see the new orbs in action in the Street View of the Sagrada Familia in Barcelona embedded below. The Twixt Aire and Calder Project in the UK have released a Google Map to showcase their collection of historical photographs of the area. Images from the Twixt Aire and Calder archive have been plotted on the map close to the location where they were taken. The photogrpahs have been grouped by date and it is possible to select to view photographs on the map by various date ranges. Each photograph also has an option to view an historical Ordnance Survey map from the same date (or as close as possible) as when the photograph was taken. Virtual Time Travel - archive film of locations. One of my own old mashups. Some of the videos may now have been removed from YouTube but there are still enough old films here to make it worth a visit. The latest Google video in the Search Stories series showcases Google Maps' new snow trails Street View imagery. For this video someone has scoured Street View and collated all the car crash imagery that they can find. Here is another Street View movie. This time Street View imagery of Vesterbronx in Denmark has been spliced together. Tom Petty is using the Google Maps API to show the locations of gigs on his latest tour. Pre-sales for the tour start on Wednesday, March 3rd. Each of the tour dates are shown the map with red map markers. If you click on a marker an information window opens with the address of the venue. The information window includes a 'get directions' option so you can get driving directions to the venue. You can even listen to a Tom Petty track as you browse the map. 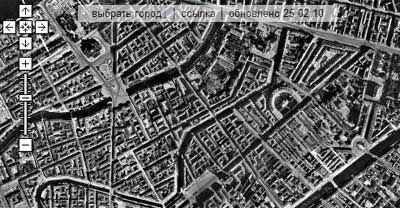 This Russian Google Maps mashup allows you to view World War II aerial photographs of Russia, Ukraine and Estonia. The photographs have been sourced from the WWII Aerial Photos and Maps website. You can select a location to view from the Выбрать город tab at the top left of the map. The site also includes an option to get a URL for each view. If you want to share a particular view you can get a link by clicking the ссылка tab. The Royal Commission on the Ancient and Historical Monument of Scotland are busy mapping declassified military aerial photographs on Google Maps. The Aerial Reconnaissance Archives have millions of military reconnaissance images of locations throughout the world declassified by the UK Ministry of Defence. The archives range from Second World War Allied and German Luftwaffe reconnaissance photographs to Cold War imagery. To date RCAHMS have mapped reconnaissance photographs in Belgium, Croatia, the Czech Republic, Denmark, France, Germany, Italy, the Netherlands and Poland. Using Google Maps to display the photographs means that users can compare the present day satellite view of locations with reconnaissance images from the past (mostly from World War II). UMapper, the Google Maps creation tool, has been very busy this year adding new functionality. Last month Umapper added an option for users to add weather to their map creations. 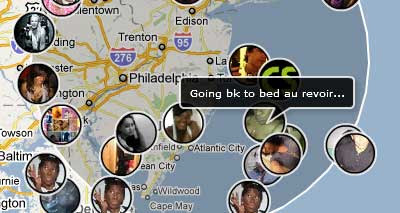 Now UMapper have added an option to add Twitter messages to a map. Using the new Twitter option you can create a map that can display all tweets from a location or filter results by a specific keyword. Like all UMapper options the new Twitter function is very easy to add to a map. Essentialy you just choose the Twitter option from the Templates tab and you have your very own Twitter map. To see the new Twitter function in operation check out this UMapper Vancouver 2010: Winter Olympics Map. truXmap claims to be the "world's first and only up-to-the-tweet food truck tracker". 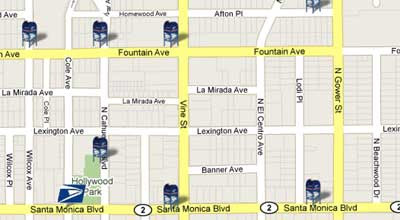 The site uses Google Maps to show the location of food trucks in Los Angeles. Using the map it is possible to browse the locations of food trucks, opening times, menus, directions, live traffic, Twitter feeds and Yelp! reviews. The site claims to be 99.9% effective. I think there may be some truth in that. The reason I say that is because one of the food truck companies displayed on the map, Calbi actually has live tracking Google Maps for each of its trucks. 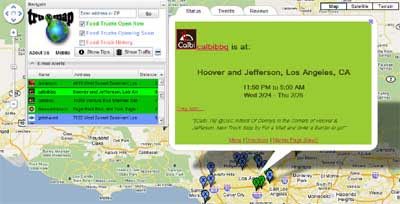 The live real-time tracking on the Calbi site seems to co-relate with the locations of the trucks as shown on truXmap. 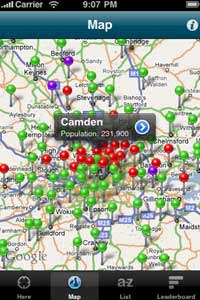 The ASBOrometer is an iPhone app that can help you avoid undesirable areas in the UK. In the UK courts often issue Anti-Social Behaviour Order (ASBO) against individuals who have been engaged in anti-social behaviour. The orders are designed to be imposed after minor incidents that would not ordinarily warrant prosecution. The ASBOrometer uses the data of where ASBO's have been issued to show an assessment of anti-social behaviour at your current location. The app also shows how many parenting orders have been issued and how many crack houses have been closed in any area. The application uses Google Maps to give you a visual overview of the areas that you might possibly want to avoid. The Madison Neighborhood Indicators Project is an attempt to demonstrate various indicators that relate to the quality of life in Madison, Wisconsin at the neighborhood level. The goal of the project is to get a better understanding of neighborhoods and to help tailor solutions to a neighborhood's particular needs or characteristics. As part of the project the NIP have produced a Google Map that presents detailed data about Madison neighborhoods. 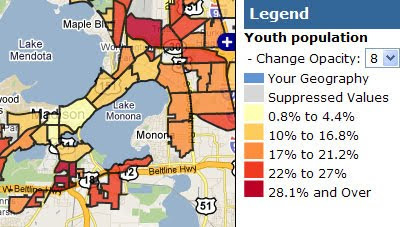 It is possible to load various demographic, crime and housing data sets onto the map to give a visual overview of Madison neighborhoods. Germany's postal service Deutsche Post is using the Google Maps API so that their customers can find the locations of post offices, letter boxes, ATM's and stamp dispensers. To search the map just enter your location and select which service you wish to view. The results will then be displayed on the map. Depending on the service you have chosen to view the map markers will display further information. For example, post office opening hours are displayed or, if you choose to view postboxes, you can view the collection times. 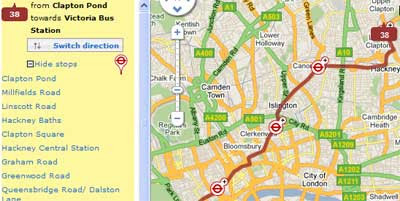 Transport for London have finally produced a Google Map of bus routes in London. Mapperz is calling it "almost a contender for the best UK Map mashup ever". Previously if you wanted a bus map in the UK capital you had to download a PDF file from the TFL website or visit an independent site like What Bus? to view bus routes on a Google Map. It is possible to search the TFL Google Map for any bus route and see it and all the bus-stops on the route on a the map. The map includes clear directions and each stop has a timetable and a frequency indicator. The map also includes optional night or daytime routes and a useful 'search for routes near here' feature. The only real drawback to the TFL map is that it does not have real-time data about bus positions. TFL actually have this information (lots of bus-stops in London have a sign indicating how long it is to wait for the next bus). The map would be a lot more useful if you could click on a bus-stop on the map and see how long it was until the next bus arrived. Mapperz says, if this were in 'real-time', similar to the real-time University of Michigan Magic Bus then this would be one of the best Google Map UK mashups ever." As it is Mapperz says that, in his opinion, Met Office Invent is still the best UK Google Map mashup. This beta release of ProtectedPlanet is the latest initiative of the World Database on Protected Areas. ProtectedPlanet lets you view the world's protected areas on one Google Map. If you click on one of the mapped protected areas then you are taken to a close-up of the selected area, which includes photographs, points of interest in the area and links to related protected areas. Each close-up view also includes links to a Google Map of the area from the Global Biodiversity Information Facility (see below). The Global Biodiversity Information Facility is an international organisation that is working to make the world's biodiversity data available anywhere in the world. The GBIF are using Google Maps to allow users to search the world database of biodiversity. 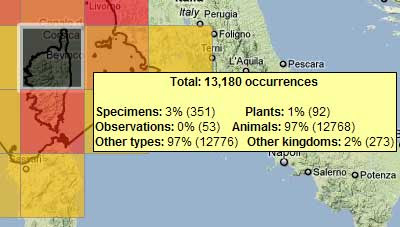 Selecting an area on the map will allow you to view that area's animal and plant species. If you click on the 'view species' button a table will load showing a breakdown of the species and even let you view photographs of the individual animals. This Google Maps mashup geo-tags news stories from the Warwickshire County Council (UK) website. The site uses OpenCalais to tag news from the council website. Those tags that it finds that are place names are then shown on the Google Map. 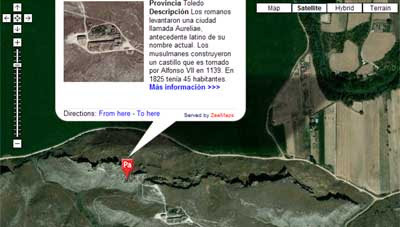 If you click on any of the map markers an information window opens displaying the relevant news story. 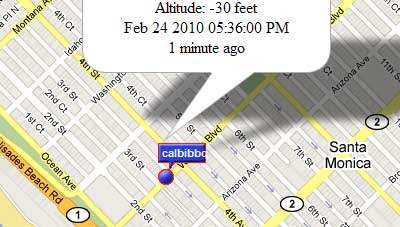 OpenCalais uses natural language processing and other methods to produce tags for any website. It then finds 'entities' within the tags such as people's names, events and, most importantly for mappers, geographical place names. It does sound like a great tool to use with the Google Maps API. Transmission News is another Google Maps mashup that uses OpenCalais to present the news on a map. The site presents news from CBC, the BBC, Reuters and CNN. It is possible to view all news services on the map at one time or select between each one. The news seems to be very current, so this looks to be a great site to keep up-to-date with breaking news. Recently at TED Blaise Aguera y Arcas stunned the crowd with a demo of a video playing in Bing Maps version of Street View. You can see the demo in action in the video below. This got me thinking that this should be possible in Google Maps Street View. I knocked up this rather lame example showing a YouTube video embedded in Street View in under an hour today. This is just a demo to show what could be possible although it isn't the greatest example. The demo would look better if I used the chromeless YouTube player (but I couldn't work out how to implement it) Now chromeless! The demo would also look better if the video played more in synch with the Street View. This shouldn't be too difficult as it would just involve synchronising the Street View yaw with the time in the video. The demo would also work better if the video used was shot from exactly the same spot from where the Street View was taken. However despite it being a rather poor example I think it shows what could be possible. Feel free to use the code if you think you can develop this further. CheckoutCheckins allows you to create a heat map of your Foursquare checkins. Once you log-in to the map with your Foursquare account it uses the places you've been to generate maps, charts, graphs, and stats. CheckoutCheckins plots your last 50 entries using Google Maps and overlays a heat map of your most recent activity. 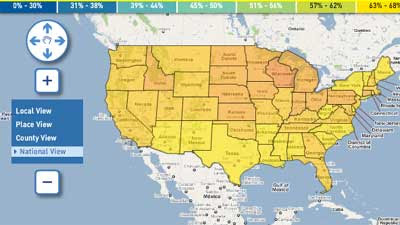 The site also produces pie charts that provide a graphic presentation of your most often visited locations. CheckoutCheckins is very similar to the already established site Where Do You Go?, which also allows Foursquare users to create a heat map of their travels. 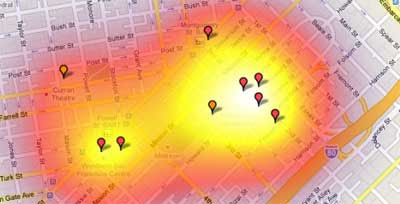 Once you log into the site with a Google account and then authenticate with Foursquare you can create a heat map that visualises your location data using color on Google Maps. If you want to add a Google Map of your Forsquare checkins to your own website or blog this tutorial is very useful. In the tutorial Michael Pucher explains how to use your Foursquare feed with Google Spreadsheets to create a Google Map that will update with your latest Foursquare checkins. Brief Encounters, Notting Hill, Chariots of Fire, The Omen and Indiana Jones and the Last Crusade are just some of the films that have been shot (at least partly) in London. 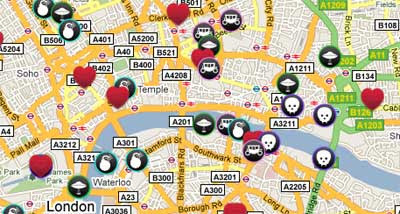 Film London have produced this Google Map to help visitors to the city visit the locations in real life. It is possible to search the map by film genre, from romantic flicks to action-packed movies or period dramas or just explore by viewing different parts of London. Film London say that the map will be kept up-to-date and more information and further layers will be added over time. Of course after trotting around all these famous locations you will want to avail yourself of a pint or two. This Google My Map can help you grab a pint and visit a film location at the same time. The map shows the locations of pubs that have been used in movies. Some of the pubs in this map have featured in films such as Lock Stock and Two Shooting Barrels and the cult classic Withnail and I.
SepiaTown is a new website that geo-tags historical photographs on Google Maps. The site also has plans to soon show film and audio clips as well. 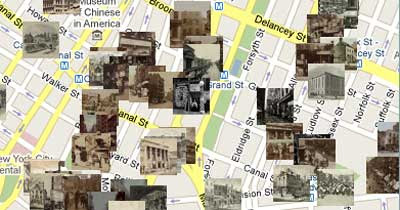 You can search the map by location and thumbnails of available historical photographs will be displayed on the Google Map. You can click on a thumbnail image to see a larger version with file and credit information, as well as notes and commentary. Last month the City University of New York (CUNY) released an interactive mapping site to pinpoint census tracts that the U.S. Census Bureau considers difficult to enumerate. The site has now released two new features, Twitter integration and area-specific stats to download. The “Twitter” tab displays a list of the latest Census-related tweets, and also shows them on the map. The map shows tweets with either the #Census or #Census2010 hashtag. When you click on the map and highlight a state, county, metro area, or tract, a download link is now provided in the hard-to-count statistics popup window. You can now not only view the data, but access it directly in Excel and Open Document formats. 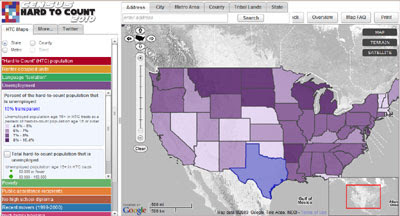 Cynergy Systems Map - Google Maps based interface for viewing census data sets. This handy iPhone app can you find the nearest car park and can even tell you how many parking spaces it has. 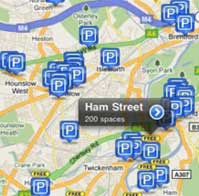 The application uses Google Maps to display the location of nearby car parks. Just use the locate button to find your current location and the app will display the nearest car parks. If you click on a car park map marker you can then view the available details, including cost and the number of free parking spaces. The app has details of over 13,400 car parks across the UK and if you buy the app in the next six days it will only cost you 59p. Where Not to Park in San Francisco - Google Map showing locations with 100 or more parking citations in San Francisco. 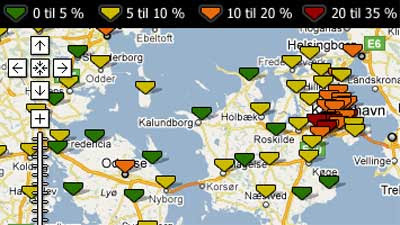 It is still exciting to see animated markers on a Google Map representing the real-time position of public transport. The latest addition to animated real-time maps comes from the University of Michigan. The University of Michigan Magic Bus map shows the real-time position of Magic Buses. The position of the buses are indicated by animated bus map markers. The markers are colour-coded to reflect each bus' route. As well as viewing the animated bus markers on the map it is possible to view individual routes and stops that serve the university. Swiss Trains - every train in the Swiss rail network in real-time. Joey Tracker - map showing the real-time position of the shuttle buses for Tufts University in Boston. Chicago Transit Authority Map - Chicago Transit Authority (CTA) real time bus tracking of routes and buses. The CASA Image Cutter is a great tool that can help you replace the Google Maps tiles with your own images. 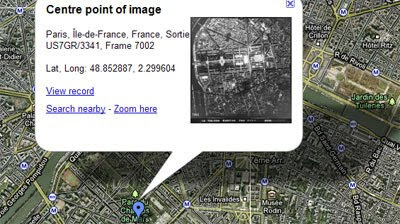 Using the tool you can showcase your own photographs, paintings or other images within the Google Maps API. Here are some of my favourite maps that have been created with a little help from the Image Cutter. Artist Joakim Dahlqvist has used the CASA Image Cutter to showcase his pen and ink drawings within Google Maps. Using the image cutter Dahlqvist has created two image maps Podalida and Aristide. 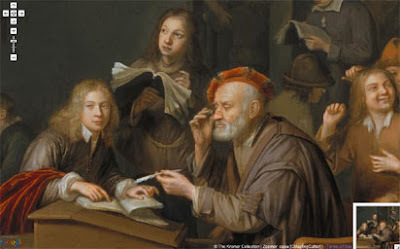 The Foundation Aetas Aurea's collection of 17th century Dutch and Flemish Old Masters viewable in the Google Maps API. CASA used their own image cutter tool to create this beautiful 3D map of the London Underground. 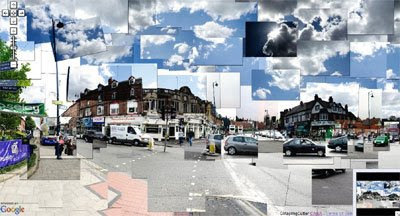 Matt Mutagh created this amazing photo collage of Moseley in the UK using CASA's Image Cutter. 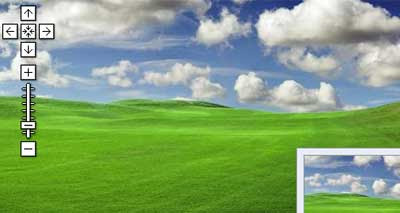 This Google Map of desktop wallpaper isn't hugely exciting in itself. However the map does come with a brief tutorial explaining how you can create your own image map using the CASA Image Cutter tool. This campus map from the University of Alabama doesn't use CASA's tool but instead uses the Mapki Automatic Tile Cutter. The map has overlayed map tiles of the university on Google Maps to show the locations of campus buildings. The site includes a brief tutorial explaining how the Mapki Tile Cutter was used to create the map. Unfortunately the Eurovision Song Contest is once again fast approaching. In what is now becoming an annual exercise in self-harm Soren Johannessen, of microformats.dk, has decided to produce another Google Map mashup featuring videos of all the song entries. The Eurovision Song Contest was introduced after World War II so that European countries could assault their neighbours with cheesy pop songs rather than gun and bombs. There is a time honoured formula to winning the contest. The winning song has to be a bouncy, strangely familiar tune, with a catchy chorus of nonsensical words. On this basis my tip for the winning song is from the Netherlands, 'Ik Ben Verliefd'. The chorus "sha-la-lie, sha-la-la (repeat ad infinitum) is just about nonsensical enough to appeal to the hordes of Euro-grannies who will decide the winner. So far only 11 out of the 39 participating countries have decided on their entries, so there is still time for a dark horse to enter the race. Soren says he will be updating the map each week to include the latest entries. Just one question Soren, "Why, oh why"? 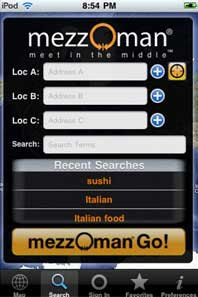 Mezzoman the mobile phone application that helps you to find places to meet friends and / or business associates is now available for the iPhone. To find a meeting place simply enter your address and your friend’s address, type in a search term (like Sushi) and press Mezzoman Go. The results you get will be based on the exact midpoint between the two (or three) addresses. Mezzoman can also use your current GPS coordinates to make it quick and easy for you to meet with someone when you are not at a known address or are on the road. Additionally, you can add a contact’s address to any address field with the tap of a button. Since the results are from Google Local Search you can easily find a top rated location between both your starting points. You can also use Mezzoman to call a business result, find it on a map, get directions, or read reviews about it. The Interactive Aggie Campus Map is one of the best University campus maps that I've seen that uses the Google Maps API. 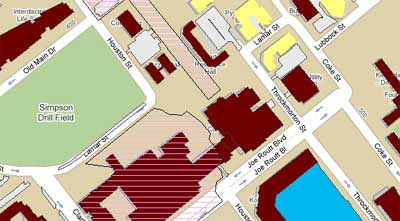 The map uses shaded polygons to display the locations of individual buildings on the campus. Clicking on any of the shaded buildings will open an information window with information and a link to the building. The map is fully searchable and has options to display car parks, individual points of interest and restrooms. The map also includes the option to view 360 degree panoramas of many of the buildings and a number of map tools. For example, there is a handy measurement tool that allows you to measure the distance between individual buildings. 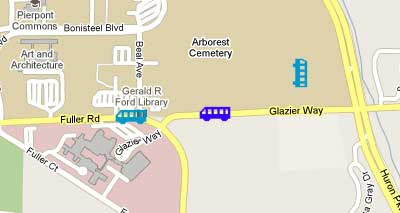 You can also view local bus routes on the map. This Google Map shows the locations of abandoned towns and villages in Spain. The red map markers indicate locations that have full descriptions and links to articles on the site's blog. If you click on a a map marker the information window includes a zoom in button. When viewing the map it is interesting to switch to satellite view and zoom in on the abandoned town. I think the site has missed a trick by not adding a Street View option. It would be great to see the Street View imagery of these abandoned towns, although I suspect Street View imagery may not be available in many of them. 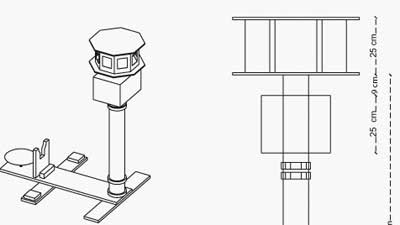 The Berlin based art group F.A.T., who recently released a video in which they pretended to bug a Google Maps Street View car and track its movements around Berlin, have released very detailed instructions explaining how you too can build your very own fake Street View car. How cool is this! A car chase video created with a little help from Google Maps. The RoriTravel Blog discovered that Disney has hidden a Mickey Mouse image in the countryside near Disney World in Florida. 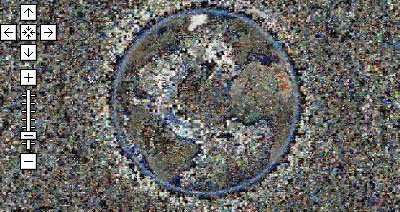 The Mickey Mouse image can be clearly seen in the Google Maps satellite view. Visit the blog for clues as to where it can be found. J.Simone Ricardo has been using Google Maps to compare the size of the virtual worlds created in Second Life with San Francisco. He discovered that Second Life has now reached 1800 sq.km. Check out his blog post to view his map of Second Life as it would look if it was actually situated off the coast of San Francisco. Google have today launched Google Maps domains in 30 African countries. Unfortunately the Google Maps for Africa blog hasn't announced which 30 African countries have been given their own domains. Tiger Beer have released an iPhone app that lets Londoners discover entertainment and activities in the city to do with the Chinese New Year. Of course, the app also lets you find nearby restaurants and bars that serve Tiger Beer. The app includes a game and an augmented reality feature. The AR feature allows you to view points of interest around you through the phone's screen.The game invloves guiding a vehicle around the streets of China Town delivering DJ decks, fireworks, and Tiger beer. What do you do when school has been cancelled because of the snow? As every schoolchild knows, you cheer loudly, grab your mittens and start building GPS enabled snowmen. At least that is what you do if you are a student in in the MobileLab class at the University of Texas at Dallas. UTD MobileLab class was cancelled last week due to record snowfall in the area so the students were set an interesting assignment instead, the Geolocated Snowman Project. 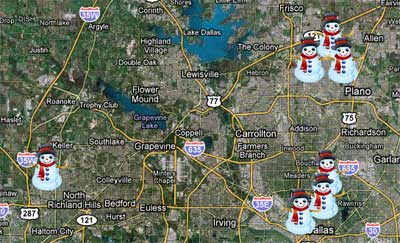 "Geolocate your snowman! If you don't make one, then some other only-possible-in-this-record-snow object/image. We can then put them all on a Google Map layer. A snowman army (or collective if you like). Take a picture with an iPhone & you'll have GPS coordinates. Send it to me with a map link and I'll create a layer. Now our snowmen will never melt..."
Of course the MobileLab class at the University of Texas at Dallas is also responsible for some more serious projects. Next month at SXSW they will be debuting placethings, an iPhone app that generates map layers from video, pictures, sound and 'stories' about locations. Check out this demo page to get a sneak preview of placethings. Riderpedia is a website for motorcyclists to share and log their favourite journeys. Bikers can use the site to create travel logs of their journeys, which can be illustrated with photographs and videos, all of which can then be viewed on a Google Map. The site also has a great journey planner. To plan a journey you just need to enter the starting location and the destination. You can then enter waypoints along your journey and Riverpedia will also suggest great places to visit along the route. Riverpedia also includes some great social sharing options. Users can vote up their favourite journeys, discuss routes with other members and share the progress of their journey with friends. The Rentables is a rental property listings website that uses Google Maps to show the locations of rental properties. 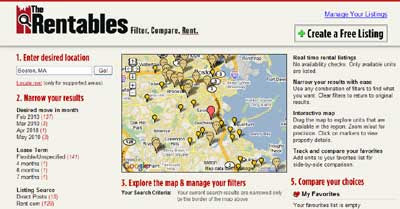 The site provides a number of interactive filters to narrow property search results. These filters make it easy to search by location, price, unit size and other characteristics. The site includes free listings posted by private users and is integrated with the leasing systems of several property management firms. The Google Map includes the dynamic loading of rental properties. If you pan the map the markers will update to show the rentable properties in your current map view. Viadat have produced a Google Maps Store Locator plugin for Wordpress. The plugin enables you to create sites in Wordpress to show the locations of stores and points of interest. The plugin allows users to import locations from CSV files and can export locations to CSV and XML for safe storage. The plugin also supports a number of themes so that you can customise the design to suit your website. This site uses the store locator plugin to show stores that stock Caybrew beer. It is possible to search the map by address. Wine Wipes are a quick and easy way to discreetly remove red wine stains from your teeth and mouth. Wine Wipes use the store locator to show the location of stores selling the product in Canada. A Florida Assisted Living Facility provides accommodation with 24 hour supervision for older adults who can no longer live independently. Florida Assisted Living use the Viadat store locator to show the locations of assisted living facilities in Florida. Mailbox Map is a Google Maps mashup showing the locations of mailboxes in the USA. Search for an address or zip code and Mailbox Map will display the locations of mailboxes in that area. If you click on a mailbox map marker the map will display the box's collection times. The site also has a mobile phone version of the map that displays USPS mailboxes, US post offices and UPS stores. The UK Postbox Finder can help you find a Royal Mail postbox in the UK. To search the map just enter your postcode and a map will display your nearest postboxes. 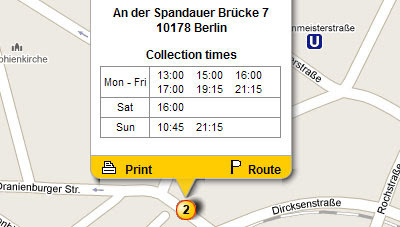 The postboxes are also listed in the map sidebar with the time of the last collection. The site uses the Google Maps API with OpenStreetMap map tiles. The Mailbox Locator helps you find USPS collection stations (blue mailboxes) and post offices in your area, and also offers the opportunity to discuss the status of individual blue mailboxes. Back in April 2005 Paul Rademacher created the first Google Maps and real-estate mashup, HousingMaps. Itssold.ca provides a nice comparison to Paul's original real-estate map, showing how things have developed in the last five years. Housing Maps pulled in data from Craigslist and allowed users to filter results by property prices. Itssold.ca has far more extensive filtering of your house requirements. The site uses a slide-bar to allow users to define the range of price that they are interested in. It also includes slide-bars to define the number of bedrooms, the number of bathrooms, the property size and the year built. The information windows on Itssold.ca also shows how Google Maps mashups have developed in the last five years. 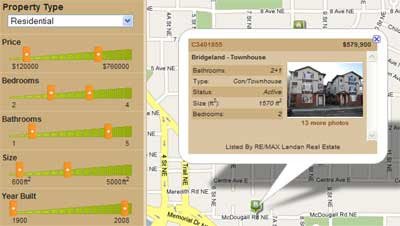 Whereas HousingMaps simply included text links, Itssold.ca contains property details and photographs. 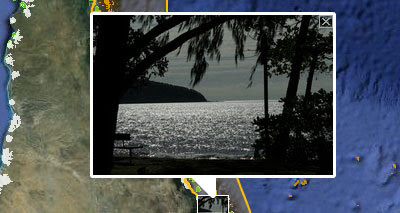 Clicking on the 'more photos' link loads a photo slideshow in place of the map. 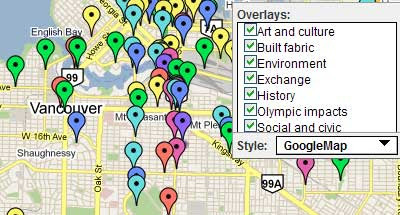 Itssold.ca also dynamically loads results directly on the Google Map. If you pan the map around map markers load to reflect your current map view. The only real omission from the site is the option to view the properties with Street View. 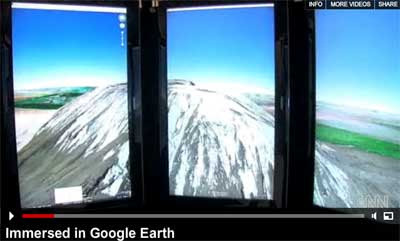 Google's Liquid Galaxy is a Google Earth booth that uses eight screens to give the user a very immersive experience of Google's 3D globe. CNN have just put out this video of Google Maps Mania founder Mike Pegg demonstrating a fly-through of San Francisco.